Watch this video from Fox News and listen to Sgt. Bret Barnum comment on the photo which has no gone viral around the world with 12-year-old Devonte Hart crying in his arms.. The embrace between Sgt. 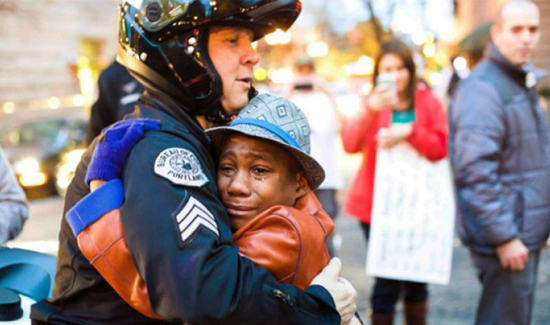 Bret Barnum and 12-year-old Devonte Hart was captured last week by a freelance photographer named Johnny Nguyen. Hart had been holding a “Free Hugs” sign in the crowd, which Barnum said made he and one of his fellow officers laugh. They then realized that the boy was crying and called him over to talk. “We just engaged in a really nice conversation. It was pretty heartfelt. I noticed through our conversation we were just talking about life, we were talking about school, we were talking about travel. I asked him the things he liked to do. He really told me he likes to do art. And so it kinda broke down some barriers between the two of us and stopped the tears that he had flowing. And It was just really heartfelt. And I could tell that we had a connection. And it just kinda evolved from there,” said Barnum. He recalled that it was a “meaningful hug” that brought tears to his eyes. “I could really tell that he was a pretty important, a pretty special kid. Intelligent for his age,” he said. Brian Kilmeade asked him how he feels about how popular the photo became. “It really shows what the nation is wanting right now. They’re wanting some hope, some change, some peace,” said Barnum, adding that he doesn’t want to take a side in the Ferguson decision. Barnum explained that there was a minimal police presence at the rally, allowing people to “vent” about the controversial decision.